3 Feet (just under a meter) of Black, Natural Antique Brown(dark) or Natural Light Brown or Natural 5mm diameter leather. And my newest color Gun Metal! Great for bracelets or a choker necklace. The natural dye process retains the natural color variations of the leather. The natural dye cord will reflect those variations. The dark, natural, light brown and natural black leather have a matte finish, the glossy black & gunmetal have a glossy finish. If you purchase multiples I will send it in one length. 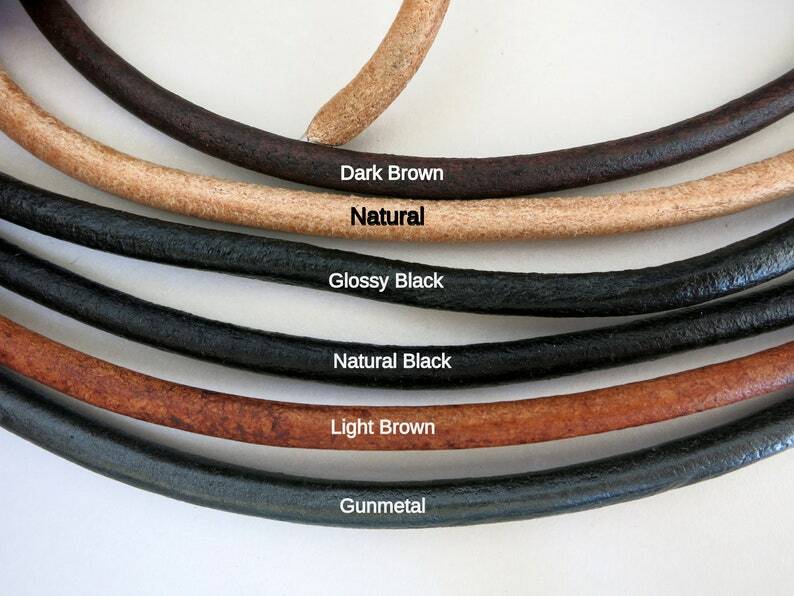 5mm Leather Cord 5 yards, Bulk Price, Gun Metal, Natural Black or Glossy Black, Natural, Dark or Light Brown, Ready to Ship! Super fast shipping. Cord is a little inconsistent width wise, but not unusable. It IS a natural product, so that is kind of to be expected. Still happy with my product, and will shop here again. Nice leather to make bracelets. Quick shipping.